So, once I got a publishing contract, I thought I’d better sort out my social media presence. What that means is blogging and tweeting on a regular schedule so that when my launch date rolls around (about six months give or take) I’d have some people to launch to. Part of this plan was to publish a parenting blog post every Tuesday lunchtime and a writing post every Thursday lunchtime. Obviously, it’s now Friday morning and I’m still writing yesterday’s post. Mind you, this is not all bad news. Now that I realise that people actually want to read what I write, my self-confidence has improved. I went back to Scrivener (a bit like MS Word but designed by authors to write books in) and found, to my surprise, that the sequel to the list actually had a structure and a few thousand words. I’d actually started in on it, before I got disheartened by the rejections, then forgot totally that I’d done it! Anyway, the point I was trying to come around to is that my blog always suffers when I’m writing. And this week is no exception. I’ve whipped the outline for the List sequel into shape and now have a writing plan laid out. The bad news is, I’m late with this blog. The good news is that the sequel has already grown by over 3,500 words since Monday. I’m also learning about marketing as I go through the process to publication. One of the (more obvious) conclusions is that my digital output (Facebook, Twitter, here, etc.) should all have the aim of attracting and engaging readers. Now, the thing is that I love the process of writing, of plotting, of telling a story. That’s pretty much what this blog has been about so far. So, I’m going to experiment. I’ll try steering more towards talking about the content of my books, the settings and characters. If I come across interesting facts in my research, I’ll use those for a blog post. Basically, gently move it in a more reader focused direction. And, of course, comments are always very welcome, let me know what you’d like to see! The life of a writer is a weird one. I plot out in advance of actually writing. I’ve never recorded my time, but I’d guess that staring at a blank page, typing fresh words is probably only 20-30% of the time I dedicate to creating a book. What do I do the rest of the time? It is split between planning it out before the first draft and editing and polishing it afterwards. If you read my other blog, The Penguin’s Knee, you’ll know that I’m also a house-husband. This involves housework, shopping, driving and other tasks that don’t engage a lot of my brain. So I daydream. This is where my plots and characters come from. The journeys which feature me thinking, what if? (My boys are all school age, so a lot of my time is my own. I don’t day-dream when I’m with the children.) What if you had a character like this? How would they react if this happened to them? On and on. Anyway, I’m currently finalising the plan for my sequel to The List. This is a police based crime novel set in South Wales. The protagonist, DS Jonah Greene works in Cardiff. But for this novel I wanted to branch out and decided to set it up in the Brecon Beacons. I was at the stage of having more than 30 scenes plotted out, and a good idea of the ending. When the thought struck me. Are the Brecons in South Wales Police area? Thankfully, I now work in the age of Google. Unfortunately I was right – most of the Brecon Beacons fall under the auspices of Dyfed Powys Police. But, because I had an outline, not a first draft, I was able to catch it. And add a new layer of complexity with inter-force co-operation and all the conflict that implies! So, that’s what put my schedule back by a week, but (hopefully) made the book a bit better! That being said, I ought to go back to polishing the plan ready to start writing new words next week. I’m a firm believer that writing is a craft. IMHO it has skills that can not only be learnt, but also honed through practice. The analogy I use most often is that writing is a bit like carpentry. I refer to my early books as “slightly wonky tables” as I was practising when I wrote them. Actually the later ones are more like perfectly functional tables that work but aren’t sufficiently accomplished or special for publication. Anyway, one thing that arises from this is a source of friction between me and The Wife. I tend to watch a film or read a book and consciously notice the salient points. Like who the protagonist is, where they meet their conflicts in the story, how the writer avoids it all being formulaic. For me this is like looking at a cabinet, and not only admiring it, but also looking at the quality of the joints, the choice of woods and appreciating how it was made. But I’ve learned not to point any of this out to The Wife while we’re in the middle of a film! I mention films a lot because the books that I’ve found most useful on story structure come from the world of screen-writing. They are quite easy to translate into novel format because they work with the basics of story telling that have been true for thousands of years. As an example, I went to see Logan last night. I won’t review it here as it’s only just out and I’ll try to avoid spoilers! But, I noticed straight away that it was very nicely written. We got straight to the protagonist, established what his life was like, and within the first 25% of the film we were sure what his objective was and who the bad guy was. What I liked was that the writers gave Hugh Jackman and Patrick Stewart plenty of time to be their characters. When we were between action sequences (it is a superhero film) they could just do what they do best with a good script. Even the side plots were all neatly dovetailed in together by the end. One reason it avoided being formulaic was by breaking the mould of a strict structure. For example was that there was one consistent bad guy, and antagonist. But throughout the film, he gained depth. He brought in new associates and his boss turned up as well. It wasn’t just Wolverine vs Bad Guy for two hours – his adversaries, while maintaining a clarity of purpose, changed and evolved. So that’s an example of how I view a film. Of course, I enjoy it very much. I love being told a good story and seeing actors work their craft in concert with everyone else, directors, writers, producers, etc. But I also like to see behind the scenes, watch the cogs turn and learn what I can. Being a house husband I (sometimes) have my days free. Recently I’ve been making more of an effort to switch off Facebook and go through the DVD collection and actively watch a film to study how it was written. How do you approach this subject? Do you just get an idea and write or do you plot? How actively do you watch films and/or read books? Please comment below – I’d love to know what my readers think! I have signed with a publisher – Crooked Cat Books – so I thought I should give some insight into the process and what I did to get here, in the hope that it might help someone else along. Everyone in the business offering advice to aspiring authors says that you should never give up. There are many tales of famous authors who have had tens or even hundreds of rejection letters before achieving success. However, I took a slightly different approach. I did get lots of rejections. The real problem was that I was getting either no response or form letters. I think I had only one personalised rejection. So, after a period of getting a bit down about it, I decided that I needed to do something different. To back up a bit, I’ve been writing for about 25 years without much success. But, just over five years ago I went on an Arvon course and learnt that writing was a skill that can be honed like any craft. I got stuck into reading books about plot and structure. I started to look at my earlier books as practice pieces. If you imagine writing is like, say, carpentry, then my earlier books were slightly wonky tables and chairs. No shame in learning that way, but if you keep making the same mistakes, well then, you’re not making progress at all. So, I had this book that had a solid structure. The characters were well formed, had crises and showed development. As I couldn’t see what I was missing, I went to a professional literary consultant. I chose Cornerstones, but others are out there. They put me with an editor and I saw the flaws. For me, it was primarily point-of-view that needed tweaking. Also, I never stopped thinking about the opening sentence and the ending. Those two bits I rewrote probably five or six times over the last year. Because it wasn’t getting picked up, I knew I had to keep changing things until it did. As well as viewing writing as a craft, the other change I made was to view it as a business. I have a head full of ideas but I realised that as an unknown, first-time author I’d be asking a lot of an agent or publisher to take on a challenging cross-genre book. So, I decided to home in on one tightly defined genre – crime. It’s not that I’m not writing what my heart wants to write, it’s more that there’s now a negotiation between heart and head. I love puzzles and thinking beyond a normal plot to what happened next. So it was very natural for me to write the kind of “what happened twenty years ago” crime novel. While I love writing it, it was also a business decision. Likewise, around the end of last year I was still getting nowhere with finding an agent. I had a professionally edited manuscript, well honed pitch letter, list of agents, everything together. So, I decided to go in a slightly different direction. Recognising that I was still a big risk, being unknown, I targeted digital-only and digital-first publishers. These have lower overheads so can take more risks. So, after making all these changes, I was very quickly accepted by Crooked Cat. I have read some of their books and feel at home here. My takeaway message then is to have persistence. But don’t have blind persistence, do it with knowledge and a clear head. Good luck and thank you for reading! 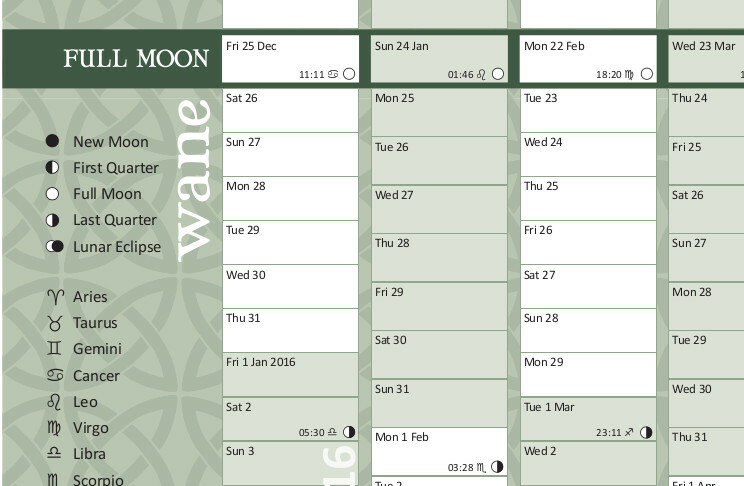 Every year I make a year planner that is arranged by the phases of the moon instead of the conventional months of the year. 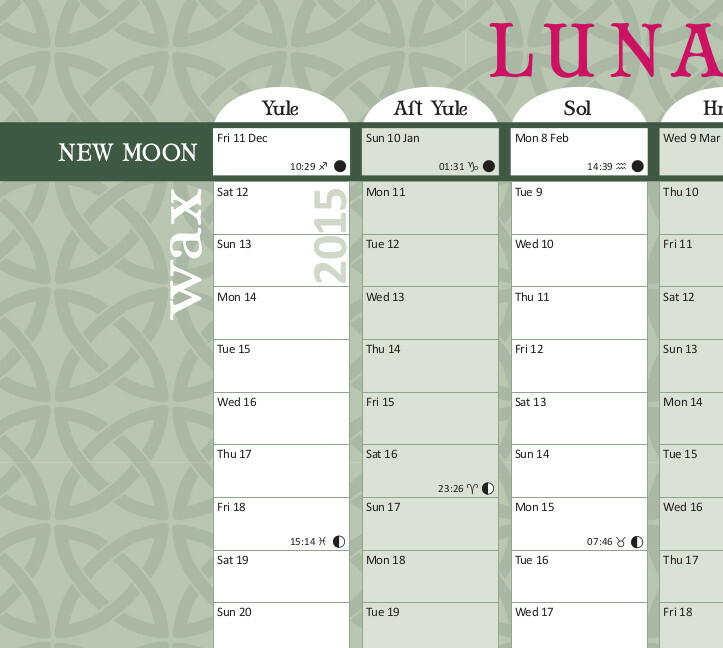 Recently I have found out that my approach of starting on the new moon is a very ancient way of measuring time (both Muslim and Jewish calendars work like this). However, for this year’s calendar, I’ve gone back a bit further and found some references to old Anglo Saxon month names. In addition to this, the months of the Gregorian Calendar are highlighted by a change in shading. Hundreds of years ago, a month would have started two or three days after the new moon, when the first crescent was visible in the sky. Today however we have accurate details, so I’ve included astrological details not only of the new moons, but also of the first quarters, full moons and last quarters. Also, I’ve included details of the celebration of the eight-fold wheel of the year and finally the dates when the clocks go forward and back! All of this is beautifully presented in an A2 wall chart with enough space to make brief notes on each day. I’ve included a couple of sample pictures cut from the file for wall chart so you can see exactly what you would be getting. Now that we are actually in 2016 and I have some left, I’ve reduced the price to £4 each including postage. This is pretty close to the cost for post and packing using a poster tube. If you want to order more than one in the same tube or if you are outside the UK, please get in touch at graham@grahamhmiller.com and I’ll send you a PayPal request for the right amount. I’ve decided to have a spring clean of my social media presence. I run four different blogs about four different aspects of my life and I am now feeling that I’d like to draw the threads closer together. This is probably a good time to apologise – if you’re an avid follower of all things Graham H Miller, then you’ll be seeing this message several times! I’ve decided to make http://grahamhmiller.com my main hub across the web. It’s the only WordPress site I’ve got a custom URL for and it also makes the most sense. I’d like to be able to import all my blogs to here, but I don’t think I can. This is quite reasonable as I’ve got different follower lists and there no reason, for example, why my Penguin’s Knee followers would want to know about Minecraft. So, for the minute, until I can figure out something more elegant, I’ll put links to everything over here on one page: https://grahamhmiller.com/otherblogs. So, whichever blog you read this post on, you can head over there to see what else I do. It’s probably worth pointing out that I write both fiction and non fiction, and grahamhmiller.com is my main blog for all things about writing. What do you, my followers, want me to do? Keep it all separate or try to merge it? Likewise, if you know more about WordPress than me and feel like being helpful, please do get in touch!